If you heart mini albums, you can add this button to your blog. Just copy and paste the code into your blogs sidebar. If your mini was featured on scrapbook crazy you can add this blinkie to your post. Full credit to me for designing all the page elements...woohoo! With a little help from the following since i'm still on my digital scrapbooking L plates. Haroldsfonts.com for the use of 'STAMP ACT' font. You are all probably thinking that we are well into the new year and that the time for giving out calendars as gifts has long passed no matter how cool they may look. Not so, I say. 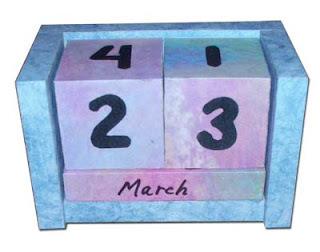 I have recently discovered perpetual calendars... the type that never end, or at least the type you don't have to throw out (or recycle) at the end of the year. For those of you who have no idea what they are or how they tick they simply are a set of months and dates that you change daily to reflect the date. 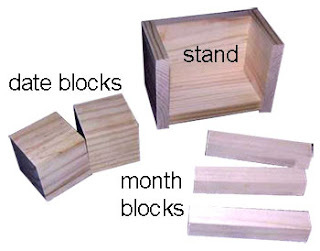 If you take a look at the pic below you will see how they work with this perpetual block calendar set made by Wayne. It has been crafted from wood and then decorated. Wayne makes these cool little wooden sets (amongst a million other things) that he sells from his Etsy store. But he is all for sharing the love and so he has ever so graciously written us this perpetual calendar tutorial which you can find at scrapbook-crazy.com. Covered in scrapbook papers these little beauties look great. You can totally coordinate them to match the decor in your home or office. I have one in the post on it's way to me right now, so i will show you it when it is all spruced up. So who wants to win one of these naked calendar kits? My dd will be picking a winner out of a hat when all the entries are in. 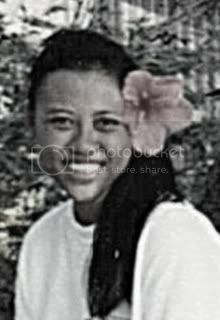 I'm reading: make or WIN a perpetual calendarTweet this! Those calendars are really cool! They would be a ton of fun to cover and decorate! The kids would love to decorate this and use it every day! Ohh soooooo cool!!! I'm a teacher - it would be SO perfect for my desk!!!! I have added it to my Candy Jar on my blog - I hope that qualifies me for 5 entries!!!! THANKS!!!! This would be great for my sister - she is a teacher. oooh..I have always looked for one of those calendars..My daycare kids would love having something like that around to help them learn the days. what an awesome idea! i think this would be a lot of fun to decorate! That would be AWESOME to decorate!!! Please enter me in your drawing! I have added you to my blog candy links on my blog! What a fantastic idea- I might get my dad to knock me one up then I could decorate it. Sorry, I had not read that someone was selling them. I don't want you to think I was stealing the idea.I hope I have not offend! hello there! thanks for viewing my blog!!! ohh the naked calendar is so cool! i really adore woodstuffs! anyway, nice blog here!!! can i link you on my blog. thanks! That's ok Catherine, that's why we have a tutorial to show you how to make them. For those of us who can't make our own can grab one from wayne if they like. options. Too cool!! I would love to cover one of those in designer paper!! These are so neat, I love to do crafts, and I'm trying all kinds of things, this would be pretty cool to add to my previous projects. they're really coolies! i've actually got them and waiting to be altered!!! I love this little calendar! How much fun would that be to create?! Wow Peata!! I love your site. . .I love all the different projects and this one is no exception. I think I'll be spending a lot of time on your blog. I'm crazy about mini albums too but wish I was faster at making them!! Thank you for sharing all your pretty creations!! This would be perfect for my grandma considering she always forgets what day it is. I love this perpetual, it is great you can decorate it as you please!!! This is so clever (and practical). It would look great on my desk. I LOVE this! Would make such a great handmade gift! I love this little calendar! I've never seen one like it before and it's just perfect for a small workspace. I'd love to win one of the kits 'cause I don't have a big strong man at home to cut one out for me, and, I don't have any more power tools since my roommate took them all when she moved away!! This is a great idea. Its really cool. It makes a great gift for kids to make and give to someone special. This would be a great craft project for my niece. My daughter would love working on this kit to make the calendar...she loves projects like this! Great giveaway - requiring creativeness to finish :) Thanks for this chance! I really am not fond of having random calenders hanging on my wall. This would be great to have! This is such a neat idea! I love the idea of being able to reuse this calendar over and over. My kids would love it as well. My oldest, who is in Kindergarden loves to cross off the days on the calendar and is working on learning days of the week, months, etc. in school, so I know he would love this. And I love the idea of being able to decorate it any way you want. These would make good teacher presents as well. What a great win! I Love scrapbooking! Oh the possibilities! How fun! Would love to win one! Now these would make nice teacher gifts! Love how they look. Wow, I would love to make one of these. so cool! I would love to have this on my desk. thanks. They look like so much fun. I have always wanted one and never found one that i liked. Thanks for the opportunity. What a great idea. No more having to buy a new desk calendar every year -- and they're nice looking, too. Looks like a great way to use up some scraps. Thanks to Wayne, too, for offering it. Why can I never come up with ideas like this? So inventive and practical. Another wonderful project on your creative blog.